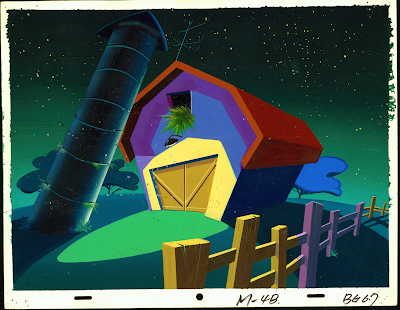 Here is a color key painted by the very talented Vicki Jensen in 1984 or so. It's from a layout I drew for a cartoon show presentation called "Rockin' At The Rim". It was a show concept created by some rich guy's kid and his swarthy lawyer. These two guys ran into cartoon writer Charlie Howell at a bar and told them their idea for the greatest show in the world and asked if he would develop it. He, in turn asked me to help him with it. Charlie is one of a handful of cartoon writers who started as an animator. I was never good at drawing backgrounds because props, objects and perspective evade me. This style though (if you can call bad drawing a style) morphed a few years later into the Bakshi Mighty Mouse style. 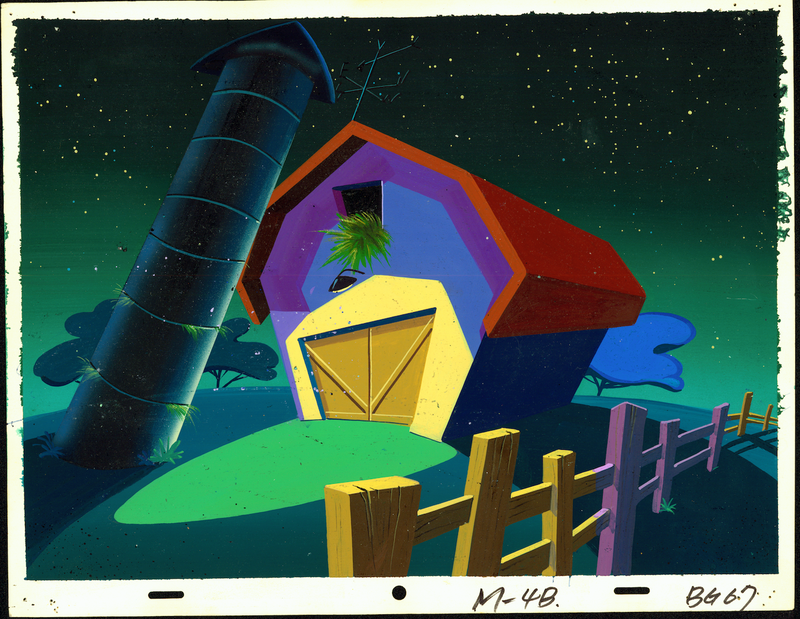 This BG (the Cow's lair) is a better drawing than mine, probably designed by Jim Smith who actually can draw perspective, and he only slightly bent things while still maintaining a composition. The painting might also be by Vicki, or at least keyed by her. This Mighty Mouse style later morphed into all out wonky cartoons when imitated by other studios who dropped the control and turned the apparent anarchy into sincere chaos. I have more stories about "Rockin' at The Rim" if anyone is interested. I might have a couple more drawings from it. I'll have to dig through my files. I wonder if Charlie still has the story notes.